"Danbury" redirects here. For other uses, see Danbury (disambiguation). 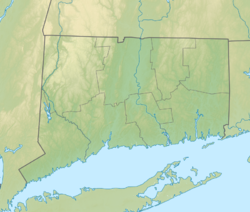 Danbury is a city in Fairfield County, Connecticut, United States, located approximately 50 miles (80 km) northeast of New York City making it part of the New York metropolitan area. Danbury's population at the 2010 census was 80,893. Danbury is the fourth most populous city in Fairfield County, and seventh among Connecticut cities. 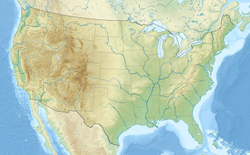 The city is within the New York combined statistical area and Bridgeport metropolitan area. The city is named for Danbury in Essex, England. It is nicknamed the "Hat City" because for a period in the nineteenth and early twentieth centuries it was the center of the American hat industry. The mineral danburite is named for Danbury. Danbury is home to Danbury Hospital, Western Connecticut State University, Danbury Fair Mall and Danbury Municipal Airport. In November 2015, USA Today ranked Danbury as the second best city to live in the United States. Danbury was settled by colonists in 1685, when eight families moved from what are now Norwalk and Stamford, Connecticut. The Danbury area was then called Pahquioque by its namesake, the Algonquian-speaking Pahquioque Native Americans (they are believed to have been a band of the Paugusset people), who occupied lands along the Still River. Bands were often identified by such geographic designation but they were associated with the larger nation by culture and language). One of the original English settlers was Samuel Benedict, who bought land from the Paquioque in 1685, along with his brother James Benedict, James Beebe, and Judah Gregory. This area was also called Paquiack ("open plain" or "cleared land") by the Paquioque. In recognition of the wetlands, the settlers chose the name Swampfield for their town. In October 1687, the general court decreed the name Danbury. The general court appointed a committee to lay out the new town's boundaries. A survey was made in 1693, and a formal town patent was granted in 1702. During the American Revolution, Danbury was an important military supply depot for the Continental Army. Sybil Ludington, 16-year-old daughter of American Colonel Henry Ludington, made a 40-mile ride in the early hours of the night on April 26, 1777, to warn the people of Danbury and her father's forces in Putnam County, New York, of the approach of British regulars, helping them gather in defense. During the following day on April 26, 1777, the British, under Major General William Tryon, burned and looted Danbury, but fatalities were limited due to Ludington's warning. The central motto on the seal of the City of Danbury is Restituimus, (Latin for "We have restored"), a reference to the destruction caused by the Loyalist army troops. The American General David Wooster was mortally wounded at the Battle of Ridgefield by the British forces which had attacked Danbury, but at the beginning of the battle, the Americans succeeded in driving the British forces down to Long Island Sound. Wooster is buried in Danbury's Wooster Cemetery; the private Wooster School in Danbury also was named in his honor. In 1802, President Thomas Jefferson wrote a letter to the Danbury Baptist Association, a group expressing fear of persecution by the Congregationalists of that town, in which he used the expression "Separation of Church and State". It is the first known instance of the expression in American legal or political writing. The letter is on display at the Unitarian-Universalist Congregation of Danbury. The first Danbury Fair was held in 1821. In 1869, it became a yearly event; the last edition was in 1981. The fairgrounds were cleared to make room for the Danbury Fair Mall, which opened in autumn 1986. Kohanza Reservoir disaster, January 31, 1869; the dam was breached, releasing a flood on the town. In 1835, the Connecticut Legislature granted a rail charter to the Fairfield County Railroad, but construction was delayed because of lack of investment. In 1850, the organization's plans were scaled back, and renamed the Danbury and Norwalk Railroad. Work moved quickly on the 23 mi (37 km) railroad line. In 1852, the first railroad line in Danbury opened, with two trains making the 75-minute trip to Norwalk. The central part of Danbury was incorporated as a borough in 1822. The borough was reincorporated as the city of Danbury on April 19, 1889. The city and town were consolidated on January 1, 1965. The first dam to be built on the river, to collect water for the hat industry, impounded the Kohanza Reservoir. This dam broke on January 31, 1869, under pressure of ice and water. The ensuing flood of icy water killed 11 people within 30 minutes, and caused major damage to homes and farms. As a busy city, Danbury attracted traveling shows and tours, including Buffalo Bill's Wild West Show in 1900. It featured young men of the Oglala Sioux nation, who re-enacted events from frontier history. Oglala Sioux Albbert Afraid of Hawk died on June 29, 1900, at age 21 in Danbury during the tour. He was buried at Wooster Cemetery. In 2012, employee Robert Young discovered Afraid of Hawk's remains. The city consulted with Oglala Sioux leaders of the Pine Ridge Indian Reservation and arranged repatriation of the remains to the nation. Wrapped in a bison skin, the remains were transported to Manderson, South Dakota, to Saint Mark's Episcopal Cemetery, for reburial by tribal descendants. In 1928 local plane pilots bought a 60-acre (24 ha) tract near the Fairgrounds, known as Tucker's Field, and leased it to the town. This was developed as an airport, which is now Danbury Municipal Airport (ICAO: KDXR). Connecticut's largest lake, Candlewood Lake (of which the extreme southern part is in Danbury), was created as a hydroelectric power facility in 1928 by building a dam where Wood Creek and the Rocky River meet near the Housatonic River in New Milford. During World War II, Danbury's federal prison was one of many sites used for the incarceration of conscientious objectors. One in six inmates in the United States' federal prisons was a conscientious objector, and prisons like Danbury found themselves suddenly filled with large numbers of highly educated men skilled in social activism. Due to the activism of inmates within the prison, and local laborers protesting in solidarity with the conscientious objectors, Danbury became one of the nation's first prisons to desegregate its inmates. On August 18–19, 1955, the Still River, which normally meandered slowly through downtown Danbury, overflowed its banks when Hurricane Diane hit the area, dropping six inches of rain on the city. This was in addition to the nine inches that fell from Hurricane Connie five days earlier. The water flooded stores, factories and homes along the river from North Street to Beaver Brook, causing $3 million in damages. Stores downtown on White Street between Main and Maple were especially hard hit. On October 13–16, another 12 inches of rain fell on Danbury, causing the worst flooding in the city's history. This time, the river damaged all bridges across it, effectively cutting the city in half for several days. Flooding was more widespread than in August, and the same downtown areas hit in August were devastated once again. The resulting damage was valued at $6 million, and two people lost their lives. The City determined the river in the downtown area had to be tamed. $4.5 million in federal and state funding were acquired as part of a greater urban renewal project to straighten, deepen, widen, and enclose the river in a concrete channel through the downtown. At the same time, roads were relocated and rebuilt, 123 major buildings were razed and 104 families were relocated. This began various efforts by the City through 1975 towards urban renewal, using another $22 million of federal funding. However, these efforts failed to reinvigorate the central business district. On February 13, 1970, brothers James and John Pardue detonated time bombs (injuring 26 people) at the police station, Union Savings Bank and in their getaway car to cover their escape from robbing the bank at gunpoint, the culmination of a two-year crime spree that included four bank robberies and five murders. The flawed primary mirror of the Hubble Space Telescope was ground and polished in Danbury by Perkin-Elmer's Danbury Optical System unit from 1979 to 1981. It was mistakenly ground to the wrong shape due to the use of a miscalibrated testing device. The mistake was not discovered until after the telescope was in orbit and began to be used. The effects of the flaw were corrected during the telescope's first servicing mission in 1993. In the August 1988 issue of Money magazine, Danbury topped the magazine's list of the best U.S. cities to live in, mostly due to low crime, good schools, and location. A case that would make national headlines and play out for over four years began on September 19, 2006, when eleven day laborers, who came to be known as the "Danbury 11", were arrested in Danbury. A sting operation had been set up where day laborers were lured into a van whose driver, a disguised Danbury police officer posing as a contractor, promised them work. The laborers were driven to a parking lot where, if it was determined they were in the US illegally, were arrested by agents of ICE and the Danbury police. Yale University law students represented the men pro bono and filed a civil rights lawsuit against the City on their behalf. On March 8, 2011, it was confirmed a settlement had been reached in the case whereby Danbury agreed to pay the laborers $400,000 (Danbury's insurance carrier paid the settlement plus legal fees of close to $1,000,000, less a $100,000 deductible). The federal government agreed to pay them $250,000. As part of the settlement, the City did not admit any wrongdoing and there were no changes in the city's policies or procedures. In 1780, what is traditionally considered to be the first hat shop in Danbury was established by Zadoc Benedict. (Hatmaking had existed in Danbury before the Revolution.) The Benedict shop had three employees, and they made 18 hats weekly. :47–48 By 1800, Danbury was producing 20,000 hats annually, more than any other city in the U.S. Due to the fur felt hat coming back into style for men and increasing mechanization in the 1850s, by 1859 hat production in Danbury had risen to 1.5 million annually. By 1887, thirty factories were producing 5 million hats per year. :52 Around this time, fur processing was separated from hat manufacturing when the P. Robinson Fur Cutting Company (1884) on Oil Mill Road and the White Brothers' factory began operation. Beginning in 1892, the industry was revolutionized when the large hat factories began to shift to manufacturing unfinished hat bodies only, and supplying them to smaller hat shops for finishing. While Danbury produced 24% of America's hats in 1904, the city supplied the industry with 75% of its hat bodies. :57 The turn of the century was the heyday of the hatting industry in Danbury, when it became known as the "Hat City" and the "Hatting Capitol of the World". Its motto was "Danbury Crowns Them All". The use of mercury in the felting process poisoned many workers in the factories, creating a condition called erethism, also called "Mad hatter disease." The effect of mercury on the hat workers' health was first noted in the late 19th century. Workers in the Danbury factories lobbied for controls on mercury in the early 20th century, however a government study on the health effects of mercury was not conducted until 1937. The State of Connecticut announced a ban on mercury in hatmaking in 1941. Although mercury was no longer used inside Danbury hat factories in the 1940s, the mercury waste has remained in the Still River and adjacent soils, and has been detected at high levels in the 21st century. By the 1920s, the hat industry was in decline. By 1923, only six manufacturers were left in Danbury, which increased the pressure on workers. After World War II, returning GI's went hatless, a trend that accelerated through the 1950s, dooming the city's hat industry. :64–65 The city's last major hat factory, owned by Stetson, closed in 1964. The last hat was made in Danbury in 1987 when a small factory owned by Stetson closed. According to the United States Census Bureau, Danbury has a total area of 44.3 square miles (115 km2), of which 42.1 square miles (109 km2) is land and 2.2 square miles (5.7 km2), or 4.94%, is water. The city is located in the foothills of the Berkshire Mountains on low-lying land just south of Candlewood Lake (the City includes the southern parts of the lake). It developed along the Still River, which flows generally from west to east through the city before joining the Housatonic River. The city's terrain includes rolling hills and not-very-tall mountains to the west and northwest called the Western Highland. Ground elevations in the city range from 378 feet to 1,050 feet above sea level. A geologic fault known as Cameron's Line runs through Danbury. The hatmaking fur-removal process was based on the use of mercury nitrate. The waste caused serious water pollution as the hat manufacturers dumped it into the Still River throughout the late 19th century and into the 1940s. This toxic product flowed into the Housatonic River and Long Island Sound, affecting water quality and various fish and other organisms. Field studies conducted in the Still River basin in the 21st century have detected the continuing presence of high levels of mercury in the river sediments and nearby soils. Danbury has a humid continental climate (Köppen Dfa), with four distinct seasons, resembling Hartford more than coastal Connecticut or New York City. Summers are hot and humid, while winters are cold with significant snowfall. The monthly daily average temperature ranges from 26.8 °F (−2.9 °C) in January to 73.9 °F (23.3 °C) in July; on average, temperatures reaching 90 or 0 °F (32 or −18 °C) occur on 18 and 3.1 days of the year, respectively. The average annual precipitation is approximately 52.1 inches (1,320 mm), which is distributed fairly evenly throughout the year; snow averages 50 inches (127 cm) per season, although this total may vary considerably from year to year. Extremes in temperature range from 106 °F (41 °C) on July 22, 1926 and July 15, 1995 (the highest temperature recorded in Connecticut) down to −18 °F (−28 °C) on February 9, 1934. It is estimated that the population of Danbury as of 2015 is 84,657. As of the 2010 census, there were 80,893 people and 29,046 households in the city, with 2.73 persons per household. 44.1% of the population spoke a language other than English at home. The population density was 1,921.4 people per square mile. There were 31,154 housing units at an average density of 740.0 per square mile. The racial makeup of the city was 68.2% White, 25.0% Hispanic or Latino, 7.2% African American, 0.40% Native American, 6.8% Asian, less than 0.10% Pacific Islander, 7.6% from other races, and 4.5% from two or more races. 32% of the population was foreign born. 6.7% of the population was under the age of 5, and 21.1% was under the age of 18. 11.1% of the population was 65 years of age or older. 50.9% of the population was female. The per capita income for the City was $31,411. 11.1% of the population was below the poverty line. The median gross monthly rent was $1,269. In 2015 the median income for a household in the city was approximately $66,676. When ZIP codes were introduced in 1963, the 06810 code was given to all of Danbury; it was shared with a then-still-rural New Fairfield to its north. In 1984, the 06810 Zip Code was cut back to areas of Danbury south of Interstate 84. A new 06811 ZIP code was created for areas north of Interstate 84. New Fairfield received its own code, 06812. In 2016 Danbury's workforce was approximately 79,400 workers. 12,200 (15.4%) of them worked in goods producing industries. 67,200 (84.6%) of them worked in service providing industries which includes: trade, transportation and utilities (17,300), professional and business services (9,400), leisure and hospitality (7,300), government (10,200) and all other (23,000). In Nov. 2016, the unemployment rate for the Danbury Labor Market Area was 3.0%, compared to 3.7% for the State and 4.6% nationally. The chief executive officer of Danbury is the Mayor, who serves a two-year term. The current mayor is Mark D. Boughton (R). The Mayor is the presiding officer of the City Council, which consists of 21 members, two from each of the seven city wards, and seven at-large. The City Council enacts ordinances and resolutions by a simple majority vote. If after five days the Mayor does not approve the ordinance (similar to a veto), the City Council may re-vote on it. If it then passes with a two-thirds majority, it becomes effective without the Mayor's approval. The current City Council consists of 14 Republicans and 7 Democrats. Danbury has six state representatives as of 2019; Raghib Allie-Brennan D-2, Stephen Harding R-107, Richard A. Smith R-108, David Arconti D-109, Bob Godfrey D-110, and Michael Ferguson R-138. There is one state senator, Julie Kushner D-24. Danbury is represented in the United States Congress by U.S. Rep. Jahana Hayes (D). Danbury's Fiscal Year 2016-2017 mill rate is 28.68. Danbury has two public high schools: Danbury High School and Henry Abbott Technical High School, each of which are for grades 9 through 12. An alternative school by the name of Alternative Center for Excellence is housed off-campus, and its graduates receive Danbury High School diplomas upon completion of their studies. Danbury also has 3 public middle schools for grades 6 through 8: Broadview Middle School, Rogers Park Middle School and WestSide Middle School Academy. There are 13 elementary schools in Danbury. These schools are Academy for International Studies Magnet School (K-5), Ellsworth Avenue (K-5), Great Plain (K-5), Hayestown (K-5), King Street Primary (K-3) and King Street Intermediate (4–5), Mill Ridge Primary (K-3), Morris Street (K-5), Park Avenue (K-5), Pembroke (K-5), Shelter Rock (K-5), South Street (K-5) and Stadley Rough (K-5). Danbury is home to Western Connecticut State University and a campus of Naugatuck Valley Community College. Danbury is the terminus of the Danbury branch line of the MTA Metro-North Railroad which begins in Norwalk. The line was first built by the Danbury and Norwalk Railroad which was later bought by the New York, New Haven & Hartford Railroad Company. Danbury was an important junction between the Danbury Branch and the Maybrook Line. The Maybrook line was the New Haven's main freight line which terminated in Maybrook, New York, where the New Haven exchanged traffic with other railroads. After the ill-fated Penn Central took over the New Haven, the Maybrook line was shut down when a fire on the Poughkeepsie Bridge made the line unusable. Today, the historic station is part of the Danbury Railway Museum. The Providence and Worcester Railroad, along with the Housatonic Railroad provide local rail freight service in Danbury. Local bus service is provided by Housatonic Area Regional Transit (HART). The city is also the location of Danbury Municipal Airport (DXR). Interstate 84 and U.S. Route 7 are the main highways in the city. I-84 runs west to east from the lower Hudson Valley region of New York to Waterbury and Hartford. US 7 runs south to north from Norwalk (connecting to I-95) to the Litchfield Hills region. The two highways overlap in the downtown area. The principal surface roads through the city are Lake Avenue, West Street, White Street, and Federal Road. Other secondary state highways are U.S. Route 6 in the western part of the city, Newtown Road, which connects to US 6 east of the city, Route 53 (Main Street and South Street), Route 37 (North Street, Padaranam Road, and Pembroke Road), and Route 39 (Clapboard Ridge Road and Ball Pond Road). Danbury has 242 miles of streets. The Danbury Public Library was established in 1879. The Long Ridge Library is a small library occupying an old schoolhouse on Long Ridge Road in Danbury. Danbury is home to numerous churches, two synagogues, and two mosques. HamletHub Danbury, a local news publication. The News-Times of Danbury, a daily newspaper owned by the Hearst Corporation. Tribuna Newspaper, a biweekly, bilingual (Portuguese/English) publication. WFAR-FM 93.3 - Portuguese Radio Station. WXCI-FM 91.7; 3,000 watts; College radio station owned by Western Connecticut State University and operated by past and present students. It receives funding from the Western Connecticut State University Student Government Association. Tarrywile Mansion and Park has 21 miles (34 km) of trails and several ponds on 722 acres (292 ha), as well as a Victorian mansion and gardens. The Ives Trail runs through the park. The Ives Trail is a 20-mile stretch of trail that runs from Bennett's Pond in Ridgefield through Danbury to Redding. The Charles Ives House and Hearthstone Castle are located along this trail. The Connecticut 9/11 Memorial by sculptor Henry Richardson is located in Danbury in Elmwood Park. The Danbury Fair Mall was built on the old fairgrounds in 1986. Danbury is also home to an Army Reserve Special Operations unit, the 411th Civil Affairs Battalion. Danbury Hospital is a 456-bed hospital, serving patients in Fairfield County, Connecticut and Putnam County, New York. The hospital is the home of the new Praxair Regional Heart and Vascular center, providing state of the art cardiovascular care to this growing region including open heart surgery and coronary angioplasty. Richter Park Golf Course is Danbury's municipal golf course and hosts numerous tournaments such as the annual Danbury Amateur and American Junior Golf Association majors. It has won a variety of awards, including being a "Top 10 Connecticut Course" and the "#2 Best Public Course in the NY Metropolitan Area". The United Hockey League (UHL) expanded to Danbury in 2004. The Danbury Trashers played their first season at the Danbury Ice Arena in October 2004. Among those on the roster included Brent Gretzky (brother of hockey legend Wayne Gretzky) and Scott Stirling (son of former New York Islanders coach Steve Stirling). Scott's older brother, Todd, coached the Trashers in the 2004–05 season. On December 27, 2009, Danbury was named the first city to officially have a new team in the newly formed Federal Hockey League (FHL). The team was named the Danbury Whalers, bringing back the name "Whalers" to Connecticut for the first time since 1997 when Hartford Whalers of the WHA/NHL moved to North Carolina and became the Carolina Hurricanes. At the end of the 2014–15 season, the Danbury Ice Arena evicted the Danbury Whalers. The Whalers were announced as moving to neighboring Brewster, New York, and called the Stateline Whalers. However, a new FHL Danbury team called the Danbury Titans was approved for the 2015–16 season, owned by local car dealership owner Bruce Bennett. As part of the approval of the new Danbury team, he took over the Stateline/Danbury market and created the Brewster Bulldogs instead of the Whalers. The Bulldogs would fold after one season and the Titans would fold after their second. The Danbury Westerners, a member of the New England Collegiate Baseball League, play their home games at Rogers Park in Danbury. AC Connecticut is a soccer team based in the Danbury suburb of Newtown. The team plays in the Northeast Division of the USL Premier Development League (PDL), the fourth tier of the American soccer pyramid. Danbury High School carries a strong athletic tradition in wrestling, boys and girls track and field, boys cross country, baseball, tennis, basketball, and football. The wrestling, boys cross country, and boys track teams have all numerous state titles and New England championships. All three programs are considered to be nationally ranked annually. Western Connecticut State University is a member of the NCAA Division III, the Eastern College Athletic Conference, and the Little East Conference. The university fields teams in baseball, basketball, lacrosse, football, soccer, softball, swimming, tennis, and volleyball. WestConn also fields several nationally competitive club sports on campus including Men's Rugby, Women's Rugby, Dance Team, Cheerleading, and Men's Hockey. The Danbury Hatters Cricket Club formed in 2001 and has been playing cricket in Southern Connecticut along with other cities such as Norwalk, Stamford, Bridgeport, New Haven, Waterbury and West Haven. Their home ground is Broadview Middle School. The Western Connecticut Militia is a semi-professional football team that played in the New England Football League from 2011 to 2016, winning the league championship the last year. The team played its home games in Danbury during that period. After taking 2017 off, the team joined Major League Football for the 2018 season, playing its home games in New Fairfield, CT.
Parts of the films Rachel, Rachel and The Sisterhood of the Traveling Pants 2 were filmed in Danbury. In the movie Blow, the character George Jung serves his 26-month sentence in the Danbury federal prison. Alfred Hitchcock filmed scenes from Strangers on a Train, including his cameo with a double bass, at Union Station (now the Danbury Railway Museum). In the Seinfeld episode The Baby Shower, Elaine explains that her roommate contracted Lyme disease when "She did some outdoor version of Hair in Danbury Connecticut". David Letterman stores his extensive collection of cars in a warehouse in Danbury adjacent to the airport. Glover Teixeira, Professional MMA Fighter in the Ultimate Fighting Championship (UFC) ranked #2 in the world in the Light heavyweight (MMA) division. ^ a b c "QuickFacts Danbury city, Connecticut". United States Census Bureau. Retrieved 15 March 2017. ^ "US Census". suburbanstats.org. Retrieved August 21, 2017. ^ "Race, Hispanic or Latino, Age, and Housing Occupancy: 2010 Census Redistricting Data (Public Law 94-171) Summary File (QT-PL), Danbury city, Connecticut". U.S. Census Bureau, American FactFinder 2. Archived from the original on September 11, 2013. Retrieved August 5, 2011. ^ The Connecticut Magazine: An Illustrated Monthly. Connecticut Magazine Company. 1903. p. 331. ^ "A Student's Guide to Danbury, Connecticut". November 4, 2009. Retrieved January 2, 2011. ^ Sybil Ludington: a Revolutionary Hero, traverseforwomen.com; accessed February 23, 2015. ^ Danbury Museum and Historical Society. "Timeline" (PDF). Archived from the original (PDF) on May 13, 2011. Retrieved January 2, 2011. ^ Danbury Museum and Historical Society. "Kohanza Disaster" (PDF). Archived from the original (PDF) on May 13, 2011. Retrieved January 2, 2011. ^ "Albert Afraid-of-Hawk". Retrieved 2 February 2017. ^ Hassan, Diane; Cedrone, Sarajane. "Rediscovering Albert Afraid-of-Hawk". Connecticut Explored. Connecticut Explored. Retrieved 2 February 2017. ^ D'Emilio, John (2003). Lost Prophet: The Life and Times of Bayard Rustin. New York: Simon and Schuster. ISBN 0684827808. ^ Kosek, Joseph Kip (2009). Acts of Conscience: Christian Nonviolence and Modern American Democracy. New York: Columbia University Press. ISBN 9780231144186. ^ Bennett, Scott H. (2003). Radical Pacifism: The War Resisters League and Gandhian Nonviolence in America, 1915–1963. Syracuse: Syracuse University Press. ISBN 0815630034. ^ Hanrahan, Ryan. "Way Too Much Weather". ryanhanrahan.com. Ryan Hanrahan. Retrieved 24 November 2016. ^ Devlin, William; Janick, Herbert (April 2013). Danbury's third Century: From Urban Status to Tri-Centennial. Danbury, CT: Western Connecticut State University. pp. 229–241. ISBN 978-0-9889243-1-4. ^ Pirro, John. "Pardue brothers bombed Danbury 42 years ago today". newstimes. Hearst Media Services Connecticut. Retrieved 15 March 2017. ^ Richard Eisenberg and Debra Wishik Englander (August 1, 1988). "The Best Places to Live in America in our second annual rating of 300 U.S. areas, the Northeast and California score best – though a New Jersey city is last". Money Magazine. Retrieved January 16, 2011. ^ Somma, Ann Marie. "Where are they now? The Danbury 11 not forgotten". newstimes. Hearst Media Services Connecticut, LLC. Retrieved 27 December 2017. ^ Perrefort, Dirk. "City officials reach $400,000 settlement with Danbury 11 day laborers". newstimes. Hearst Media Services Connecticut, LLC. Retrieved 27 December 2017. ^ Robinson, Alfons o. "The public deserves to know the truth about the Danbury 11 case". Hearst CT News Blogs. Hearst Communications, Inc. Retrieved 27 December 2017. ^ Pirro, John (Feb 1, 2011). "The rise—and fall—of hatting in Danbury". Danbury News-Times. Retrieved 15 September 2015. ^ a b c d Varekamp, Johan. "'Mad Hatters' Long Gone, But The Mercury Lingers On". Daily University Science News. Retrieved 15 September 2015. ^ a b c d e Devlin, William E. (1984). We Crown Them All (First ed.). Windsor Publications, Inc. ISBN 0-89781-092-9. ^ a b "National Register of Historic Places Inventory--Nomination Form: P. Robinson Fur Cutting Company". 1982-10-15. Submitted to the National Park Service by the Connecticut Historical Commission. ^ Wajda, Shirley T. "Ending the Danbury Shakes: A Story of Workers' Rights and Corporate Responsibility". ConnecticutHistory.org. Retrieved 2018-10-21. ^ a b Bronsther, Rachel; Welsh, Patrick. Mercury in Soils and Sediments (Report). Wesleyan University. Retrieved 30 September 2015. ^ Devlin, William E.; Janick, Herbert F. (April 2013). Danbury's Third Century: From Urban Status to Tri-Centennial (First ed.). Danbury, CT: Western Connecticut State University. pp. 190–191. ISBN 978-0-9889243-1-4. ^ Serra, Janet (2011-06-02). "Magnificent Millinery: Three Centuries of Women's Hats in Danbury CT". Connecticut Travel. Western Connecticut Convention and Visitors Bureau. ^ Libov, Charlotte (1988-03-20). "Mecca for the Bargain Hunter". The New York Times. ^ "Danbury: Geography and Climate". City-Data.com. Advameg, Inc. Retrieved 8 November 2016. ^ Varekamp, JC; Buchholtz ten Brink, MR; Mecray, EL; Kreulen, B (Summer 2000). "Mercury in Long Island Sound Sediments". Journal of Coastal Research. 16 (3): 613–626. JSTOR 4300074. ^ "Connecticut". Netstate, LLC. Retrieved 7 November 2016. ^ "NowData – NOAA Online Weather Data". National Oceanic and Atmospheric Administration. Retrieved March 2, 2012. ^ "U.S. Decennial Census". Census.gov. Archived from the original on February 8, 2006. Retrieved December 19, 2012. ^ Bethel population; Bridgewater population; Brookfield population; Danbury population; New Fairfield population; New Milford population; Newtown population; Redding population; Ridgefield population; Sherman population Archived June 30, 2013, at the Wayback Machine. Hvceo.org. Retrieved on 2013-07-15. ^ Office of the Secretary of the State Archived September 13, 2005, at the Wayback Machine. Sots.state.ct.us. Retrieved on 2013-07-15. ^ St. Hilaire, David W. "Comprehensive Financial Annual Report" (PDF). City of Danbury. ^ St. Hilaire, David. "Comprehensive Annual Financial Report" (PDF). City of Danbury, CT. Retrieved 25 February 2017. ^ St. Hilaire, David. "Comprehensive Annual Financial Report" (PDF). City of Danbury, CT. Retrieved 19 February 2017. ^ a b "City of Danbury, Connecticut – City Council". City of Danbury, Connecticut. Retrieved November 17, 2008. ^ "Connecticut General Assembly". Retrieved July 1, 2016. ^ "Danbury Connecticut Legislators". Connecticut Business & Industry Assoc. Retrieved June 17, 2016. ^ "Mill Rates". Office of Policy and Management. Retrieved February 26, 2017. ^ "Academic s". Alternative Center for Excellence. Retrieved 25 November 2015. ^ "Danbury Public Schools". Retrieved 25 November 2015. ^ "St. Gregory the Great School - Danbury, Connecticut .:. Welcome". Retrieved July 1, 2016. ^ "Colonial Hills Christian Academy". Retrieved July 1, 2016. ^ "Immanuel Lutheran School, Danbury, CT". Retrieved July 1, 2016. ^ "New England Country Day School Profile - Danbury, Connecticut (CT)". Retrieved July 1, 2016. ^ "NVCC Danbury Campus". NVCC. Retrieved 16 July 2016. ^ a b "FCI Danbury". Federal Bureau of Prisons. Retrieved 2016-07-16. ^ Ryan, Maggie (July 17, 2013). "FCI Danbury Prison Being Converted to House Males". Correctional News. ^ Freedman, Dan. "Women's prison construction to start this summer". Connecticut Post. Retrieved 16 July 2016. ^ Ryser, Bob (December 2, 2016). "Enhanced FCI set to reopen to women". The News-Times. ^ "Our History". Friends of the Danbury Library. Retrieved 2017-02-11. ^ "Danbury's Long Ridge Library Embraces Past, Moves Toward Future". Danbury Daily Voice. ^ Venta, Lance. "107.3 The Bull Launches In Danbury". radioINSIGHT. Retrieved 17 July 2016. ^ Perrefort, Dirk. "Danbury gets a new alternative rock station". newstimes. The News-Times. Retrieved 18 July 2016. ^ "Bear Mt. Reservation Danbury, CT". BerkshireHiking.com. Retrieved July 1, 2016. ^ "Old Quarry Nature Center, 5 Maple La., Danbury, CT 06810". Archived from the original on June 29, 2016. Retrieved July 1, 2016. ^ "Tarrywile Park and Mansion, Danbury, CT: Hiking, Weddings, and Events". Retrieved July 1, 2016. ^ "Parks". DANBURY CT. City of Danbury. Retrieved 24 July 2016. ^ Pelland, Dave. "9/11 Memorial, Danbury". CTMonuments.net. Retrieved 11 March 2018. ^ "About Danbury Hospital". Danbury Hospital. Danbury Hospital. Retrieved 20 November 2016. ^ Danbury Hospital, Western Connecticut Health Network. Danhosp.org. Retrieved on 2013-07-15. ^ Richter Park Golf Course - Danbury, CT. Richterpark.com. Retrieved on 2013-07-15. ^ Richter Park Golf Course - Course Stats Archived August 4, 2011, at the Wayback Machine. Richterpark.com. Retrieved on 2013-07-15. ^ Skodnick, Leif. "Brewster Bulldogs suspend operations". Lohud. The Journal News. Retrieved 15 July 2016. ^ Lacey, Ryan (Aug 3, 2017). "Titans throw in the towel". Hearst Media Services CT. LLC. The News-Times. ^ "Danbury Cricket Club". CricClubs.com. Retrieved 18 November 2018. ^ "Militia Join the MLF!". Western Connecticut Militia. www.HomeTeamsONLINE.com. Retrieved 13 October 2018. ^ "Rachel, Rachel (1968) Filming Locations". IMDb. IMDb.com, Inc. Retrieved 1 March 2017. ^ "Production Notes "SISTERHOOD OF THE TRAVELING PANTS 2"". CinemaReview.com. CinemaReview.com. Retrieved 1 March 2017. ^ "Blow (2001) Quotes". IMDb. IMDb.com, Inc. Retrieved 1 March 2017. ^ Ofgang, Erik (April 29, 2006). "Recalling Alfred Hitchcock's visit". Danbury News-Times. Retrieved 17 June 2016. ^ "The Baby Shower". Seinfeld Scripts. Retrieved October 29, 2016. ^ Koonz, Brian. "David Letterman's 10 Ferraris stored at Danbury warehouse". ctpost. Hearst Media Services Connecticut, LLC. Retrieved 22 February 2017. ^ "Happy Birthday To Danbury's Tracy Chapman". Retrieved July 1, 2016. ^ Gregory, Richard. "Pitching great Lee Smith shares words of wisdom with local ballplayers". newstimes.com. The News-Times. Retrieved 30 June 2016. ^ Index to Politicians: Tutton to Tylee. The Political Graveyard. Retrieved on 2013-07-15. Wikimedia Commons has media related to Danbury, Connecticut. Wikivoyage has a travel guide for Danbury, Connecticut.